Brazil's presalt area remains a focus for investment in South America. Sean Ottewell reports. Brazil's emerging presalt play is uncovering large carbonate reserves deep below thick salt layers buried over 2000 metres deep. According to Baker Hughes, while the carbonate reservoir, the salt layer, and the water depth all represent major challenges to optimally drill, complete, and produce - the prize is massive. So the company is focused on maximising its customers' return on investment by offering help to optimise drilling and production while reducing intervention in these substantially challenging plays. 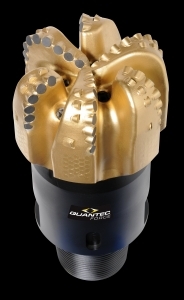 To this end it has significantly improved the rate of penetration (ROP) in these slow-to-drill carbonates with its TruTrak drilling system, CoPilot real-time drilling optimisation service and Quantec premium polycrystalline diamond compact (PDC) bit-bottom hole assembly (BHA) combinations (Fig. 1). Baker Hughes' intelligent production systems give users the information and ability to make confident decisions that accelerate production, increase ultimate recovery, and reduce total cost of ownership. Selectively controlling the drawdown of each producing zone can prevent formation damage caused by sand fines movement, asphaltene precipitation, and scales. "We can change flow characteristics while minimising intervention and associated cost, risk, and production downtime. This approach can add millions of Dollars to a well's net present value through accelerated production and ultimate recovery," says the company. Meanwhile Aker Solutions has signed a frame agreement with Petrobras to supply 40 subsea trees for the Iara and Guará fields, located in the challenging pre-salt area of the Santos basin offshore Brazil. The contract value is approximately US $300 million. Scope of works includes engineering and manufacturing of 40 vertical subsea trees for 2500 metres water depth, subsea control systems and 17 complete tool sets. Delivery will take place over the next four years. With this latest contract for Iara and Guará, Aker Solutions will provide subsea production equipment for all the three initial field developments of the Brazilian pre-salt area. The first pre-salt subsea job was awarded in December 2008, when Aker Solutions won a contract to supply nine subsea trees for the Tupi pilot project. "Our experience developing the Tupi pilot project, the expanded manufacturing capacity at our facility in Curitiba and a consistent commercial and technical proposal were crucial to secure this contract. This evidence is aligned with our objective of being Petrobras' preferred partner for subsea developments," said Marcelo Taulois, president of Aker Solutions' subsea business in Brazil. Mads Andersen, executive vice president of Aker Solutions, highlighted what he described as the company's market leading deepwater technology as another decisive factor in winning this contract: "In recent years, Aker Solutions has made significant investments in Brazil - both in developing suitable deepwater technologies and our manufacturing capacity. Our current dominance in the pre-salt area is also down to a highly qualified workforce which is dedicated to meeting the future demand of the Brazilian oil industry. Our company is well prepared to help Petrobras explore the pre-salt layer." The Guara field (BM-S-9) will receive 14 trees of this contract, and will be explored by a consortium where Petrobras has 45 per cent participation, BG Group has 30 per cent and Repsol YPF 25 per cent. The Iara field (BM-S-11) which belongs to Petrobras (65 per cent), BG Group (25 per cent) and Petrogal (10 per cent), will receive 26 trees. The complete scope of work will be managed, engineered and executed by Aker Solutions' manufacturing facility in Curitiba, Brazil, with support from Aberdeen, UK, for the subsea control systems. Delivery of the first subsea tree is scheduled for the end of 2011. Aker Solutions has built up a significant presence in Brazil since establishing the company in the country in 1978. Today Aker Solutions has 850 employees in Brazil, of which 99 per cent are Brazilian nationals. In April Repsol and Petrobras confirmed to the Brazilian authorities the commercial viability of a discovery made in January in the Piracuca well, in the BM-S-7 block of Brazil's Santos Basin. The Piracuca well holds significant amounts of hydrocarbons, Petrobras, the operating company, estimates preliminary in place volumes of light oil and natural gas of 550 million barrels of oil equivalent (BOE). The BM-S-7 block is located 218 km off the southern Brazilian state of Sao Paulo, at a depth of 3967 metres in water 240 metres deep in the Santos Basin. Repsol, which holds 37 per cent in the site, and Petrobras, the project's operator with 63 per cent of the block, announced the presence of commercially viable reserves in a statement filed with the Brazilian authorities. In January the company had made another oil find in the Santos Basin, in the well called Panoramix (S-M-674), in the BM-S-48 area 180 km from the coast of Sao Paolo in water 170 metres deep. This well is currently under evaluation. The development of the Santos Basin offshore Brazil is one of the ten key projects included in Repsol's 2008-2012 strategic plan. Offshore Brazil, an area that has great exploratory potential, has become one of the company's main growth vectors. Repsol is the second largest-largest owner of exploration rights after Petrobras in the Santos, Campos and Espirito Santo basins, participating in 24 blocks of which it operates eleven. Repsol is together with Petrobras leading the way in exploring the Santos Basin, where 19 of these 24 blocks are located. In another sign of interest in Brazilian oil fields, Statoil has agreed to sell 40 per cent of the Peregrino field to Sinochem Group for US$3.07b in cash. Statoil maintains 60 per cent ownership and the operatorship of the field. "The transaction confirms the high quality of the Peregrino asset, reflecting Statoil's value added through the field development. The transaction demonstrates Statoil's ability to leverage its industrial competence developed at the Norwegian Continental Shelf, and realise value for our shareholders. The divestment is a natural step in our continuous effort to optimise our portfolio", says Helge Lund, ceo of Statoil. "We are pleased with the transaction and look forward to partner with Sinochem Group in the further development and operations of the large Peregrino field. Both companies see many opportunities for value creation through increased recovery and exploration for additional resources in the decades to come. I am pleased that we also have agreed to sign a memorandum of understanding to jointly investigate further opportunities in Brazil and elsewhere", says Lund. The transaction is subject to government approvals in Brazil and China. The consideration is based on an effective date of 1 January 2010 and subject to customary adjustments. The divestment of a 40 per cent share of Peregrino will reduce Statoil's equity production guiding for 2012 by 40 000 BOE/day to a range of 2 060 000 - 2 160 000 BOE/day. Brazil will continue to form a key part of Statoil's international strategy. The company remains committed to complete the Peregrino development as planned, operate the field efficiently, and to explore further growth opportunities in the region. The Peregrino field is located 85 km offshore Brazil in the Campos basin at about 100 metres of water depth in BMC-7 and BMC-47. The first phase of the development includes two drilling- and wellhead platforms and a ship-shaped floating production, storage and offload unit (FPSO). The field was discovered in 1994. Statoil (then Norsk Hydro) acquired 50 per cent in the discovery in 2005, and the remaining 50 per cent and its operatorship in 2008.